Lighting is more than just turning on flash on your camera, and is a skill learnt over many years. Practice using daylight in your photography to see what works best. This can be anything, a bit of silver foil on a card, a white napkin, whatever’s to hand. Simply hold your reflector on the darker side of your picture and see the difference it makes. Ever see pictures on a blog that look like they've been shot in orange light? You want to avoid that. 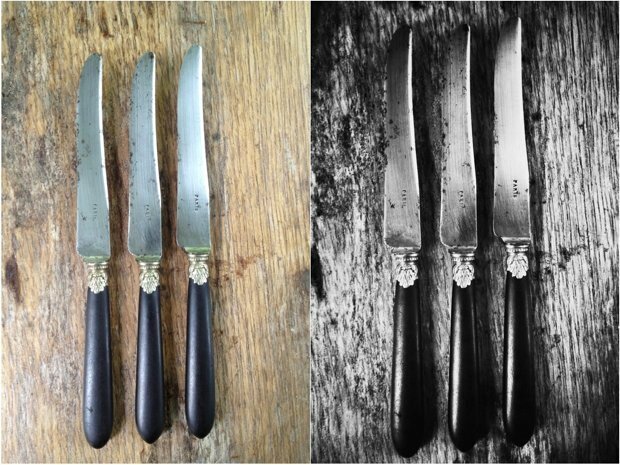 Try simple colour correction apps like Filterstorm or Perfect Photo to de-orange your photos. Shoot lots. Then shoot more. The great thing about digital photography is that you can shoot to your heart's content. Shoot, adjust and shoot again. It doesn't cost anything and it gives you another chance at an amazing picture. If you're wondering why everyone's pictures look the same, it's because they all use Hipstamatic & Instagram. Try different photo apps, tinker, and play around if you want your photos to stand out. Remember, people will look at your work, and comment on the one picture they don't like. Take your time, make sure ALL your shots are amazing, then post your best to silence the critics. When asked what he thought the best camera was, Pulitzer prize winning photojournalist Barry Staver came up with the memorable quote “It’s the one you have with you”. Very few of us these days do not have a mobile phone, and very few of us have a mobile phone without a camera, so, logically, the ‘one we have with us’ will almost always be our phone. I’ll have to put my cards on the table here. I’m a Mac user. As a professional photographer, 100% of the business I’m in runs on Macs. It’s become ‘industry standard’, simple as that, so this article will be Mac biased. I have an iPhone 4s and a LOT of apps. I’ve whittled them down to what I consider to be the essentials, and will come back to this at the end of the article. A lot of these apps are now available for Android, and there are plenty of on line sites to help you out. All the pictures included in this article have been shot and processed using ONLY in-phone apps. The one criticism that most serious photographers come up with when iPhone photography is mentioned is that so many people are taking so many pictures that all look the same. I agree that by using Hipstamatic, or Instagram, putting one treatment, or filter on it and uploading it to the internet, it’s almost certain that you’ll end up with a picture that looks just like ten million others. The solution? Use more than one app or treatment. All the pictures here have been through several. Start with one, Save it to your photo library and put it through another, then another till you get what you like. I always say that one of the great things about photography is that there are no rules. If you like an image, that’s enough, and that is more true than ever when it comes to using your phone. One of the main reasons for adding all these effects to our smart phone pictures is simply that we can. As a professional photographer, I love it. It’s fun, and that, for me is the whole point. I WANT my iPhone pictures to look like they were taken on my phone…I have my ‘big cameras’ to do all the high-end technical stuff! I’ve been in the unfortunate position recently of having to spend a lot of time in Doctors surgeries, and one of the things that has helped while away the time is playing around with my pictures. I can heartily recommend it! Whizzing a picture from app to app and back again, then emailing a full-res picture to myself to look at on my screen when I get back to my desk. I’m really enjoying shooting with my phone. Having fun with all the fx, loving the images I would have otherwise missed, and realising that as photographers, there’s really no excuse these days to consider oneself ‘off duty’! In fact, I’ve recently added an ‘iPhone’ gallery on my new website. 2. Use a reflector. This can be anything, a bit of silver foil on a card, a white napkin, whatever’s to hand. Simply hold your reflector on the darker side of your picture and see the difference it makes. 3. Take the bl**dy orange out! I HATE seeing pictures whacked on someones blog that have not been colour corrected. They’re horrible, and make you look lazy...The solution is dead easy…Filterstorm & Perfect Photo are both brilliant apps, easy to use and perfect for colour correction on the move. 4. Shoot lots…then shoot lots more. Just taken a nice picture? You sure? Take another one. Then look at it…could you move something a little bit? Take something out? It doesn’t cost any more, and gives you more chance of getting a cracking picture. Just delete all the ones you don’t like when you get home. Stop rushing things...look…REALLY look, then when you’ve looked think. In my professional life as a photographer (35 years and counting!) The one constant has been that whenever anyone looks at my work, they will remember, and comment on the ONE picture they didn’t like! Don’t give them the chance…if there’s anything you’re not sure about, don’t use it. Simple! And last but not least, If I could only use one app on my phone? Snapseed. It’s fantastic. Every picture I’ve used here has at some point been through Snapseed (and incidentally, no, they are not giving me any money for saying this!) and I heartily recommend it. To sum up… For me it’s never going to replace a ‘proper’ camera, but, I enjoy it! It’s fun, and with a bit if effort you can produce some very interesting images. Will it all last? Who knows, but rest assured, there are some great images out there in the ‘Democratic Republic of iPhoneography’. Remember…don’t over process, but don’t under process either. Use the apps for what they can do to make your images look fabulous. Put your cynicism on hold and give it a go. You may just surprise yourself! Tim Clinch has been a photographer all his working life. He spent five years assisting in London, then ran his own studio in Clerkenwell. In the early 90's he moved to Spain, where he lived and worked for eight years, five years in Madrid and three in the province of Cadiz followed by many years in South West France. These days, he's still a nomad, dividing his time between England, France and Bulgaria. Tim says: "It doesn't really matter where I 'live' as I'm always travelling." His latest passion is discovering Eastern Europe, especially the fascinating country of Ukraine. Tim works for a wide variety of magazines all over Europe and America, including CN Traveller, Forbes Life, Town & Country, Food Illustrated and House & Garden, and has had many books published, the latest being 'England's Hideaways', a guide to the best secret hotels and castles in the UK (pub. Rizzoli). Tim is currently working on a new publishing project with food writer Kate Hill about the food and food producers of South West France, called 'Food Stories from Gascony' - follow their progress here. Tim was chosen as an exhibitor in the prestigious Food Photo Festival in Tarragona, Spain in 2011, and this year was an award winner at the Food Photographer of the Year awards in London. Alongside his commercial work he runs food photography workshops in France (which our own Mardi took this past summer and can highly recommend) and Spain. This is a wonderful piece! Love that Tim Is straight up with his advice and isn’t afraid to tell us how it is! As a side note, you can do a lot of what’s listed here with any smart phone. I do all my mobile photos with a blackberry and a little help from Dropbox and my iPad’s apps (including Snapseed!). And Android phones have some great apps too so don’t think if you don’t have an iPhone that you can’t still take and process some amazing mobile photos! Great article! Off to browse through my apps now, since I just started using an iPhone. Thanks! Thank you. Thank you. Thank you. Thank you. Thank you. THANK YOU. Excellent article. Very specific and helpful. I, too, am all mac. I find it so so so hard to do the “slow down” thing… taking the photo is hard enough to do on the run with my phone – but to slow down – do it right – then put it through a variety of apps. Not so sure that is going to ever happen, but it makes sense that it would be an excellent way to learn what works best. I will definitely be downloading and exploring a few here! Thank you so much for sharing. My iPhone camera is the only camera I have. I will certainly make use of your suggestions. Cheers! Still finding my way with my iPhone camera so this is really helpful. Fingers crossed that I’ll finally get a shot worth saving (or posting). Thanks. Hi Barbara. The photo software I use for 95% of what I do is Lightroom…it’s wonderful and intuitive. I heartily reccomend it! Incidentally…although I reccomend both Snapseed & Lightroom all the time, I am not in their employ, nor do they give me anything for free! Nice article but i think you missed Instafusion app….just try once…it has a very easy and beautiful interface…. This is awesome blog for food photography presentation. I love how it doing in editing and the software that you used is great. Thank you!